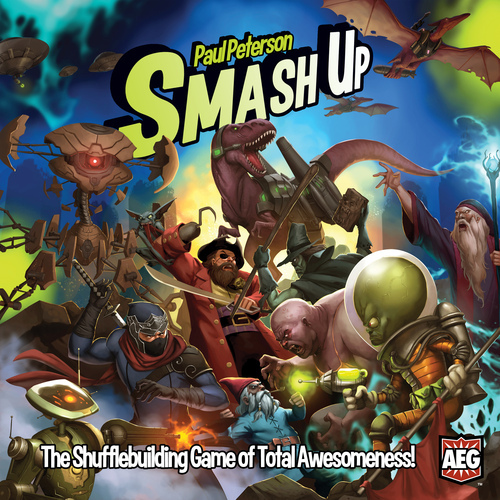 A Review of Smash Up! You know what the world needs more of right now? Card games! Okay, Smash Up isn’t a deckbuilder, so I’ll give it a pass. What it is is a fast filler that has lots of room for expansion. 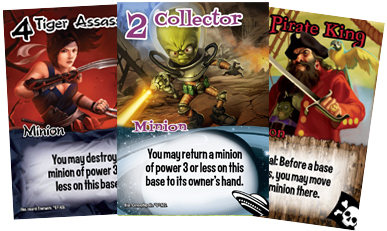 The game comes with eight different “factions”—a set of cards with a theme. There are pirates, ninjas, dinosaurs, aliens, zombies, wizards, tricksters, and robots. Each faction is very thematic and plays very differently. The ninjas can swoop in and exert influence at the last second, while the zombies can take things out of their discard pile. Basic stuff. But where Smash Up is different is that you mix two of the factions, shuffle them up, and have a different combo each game. So you could have zombie pirates, or trickster dinosaurs, or alien robots. You get the best of each faction! Each faction has Action cards (that let you do cool stuff), and Minion cards (that exert influence and also do cool stuff). The point of the game is to get to 15 victory points (VPs), and the way you (mostly) do that is by scoring Bases. The game comes with a slew of Bases, each with a unique name and special ability. So on one Base, each Minion there exerts +1 influence, or if you place a Minion on this base you can add another Minion to another base. Each Base has a different trigger number, and once the influence of all Minions there adds up to that trigger number, you score the Base. Generally, 1st, 2nd, and 3rd place at a Base score, and the amount depends on the Base. It’s a pretty fun game, and a fast…ish filler with some neat combos. And I see that there’s lots of potential for expansions–and it’s put out by AEG, so YOU BETTER BELIEVE THERE WILL BE EXPANSIONS. My biggest problem is that there’s special text on the bases and all of the cards. So you spend a lot of time reading your own cards, reading your played cards out loud to the rest of the table, and reading other people’s cards (and the base cards) already on the table. So what should have been a fast filler can be just a bit too long for what it is. Also, some VP chits would have been nice. Still, this is a fun game, and light enough that I could play it with my kids, or a youth group, or some nongamers. Check it out! It’s been a busy week here following Gencon (which we didn’t go to…). So once again we’ve wrapped up all of our posts from the week and put a pretty bow on them for you! Here they are! Monday we checked in with those who DID go to Gencon! We also took a look at some exciting news coming from Fantasy Flight Games! Jeremiah took a cheap shot at a kids game. We discovered that Dominion was being digitized! Firestone brought us some news about the new Resistance! The Heartland Hauling Co. Hit its first stretch goal and we got to peek at their meeples! 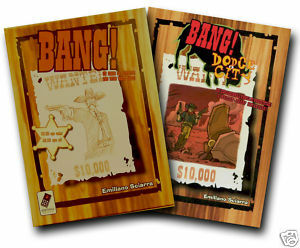 And Jeremiah reviewed the spaghetti western card game BANG! It’s been a busy week, but a great one! Thanks so much for all of your support and for reading our little blog! We’ve got more reviews, news and an interview with Ben Rosset, designer of “Mars Needs Mechanics” coming at you next week! If there are any games you would like us to review, or find more news about feel free to leave ’em in the comments below! The weekend is coming, what games are you playing?!? Today we’re taking a look at the spaghetti western card game, Bang! Released in 2002, it’s been augmented by several expansions, and now a third edition release has kept the franchise thriving. Some expansions can only be found in the “Bang the Bullet,” which features the base set and all of the game’s expansions in a nifty bullet shaped tin. The game play is pretty simple: shoot everyone else (with “BANG!” cards), gain weapons to increase your range so you can shoot everyone at the table, and try to get a few defensive cards (Missed! cards), or hang onto some cards that will heal damage (we’ll talk about those in a minute). Where the game really thrives is in the intrigue and strategy department. Each player is randomly dealt a character and a role card. 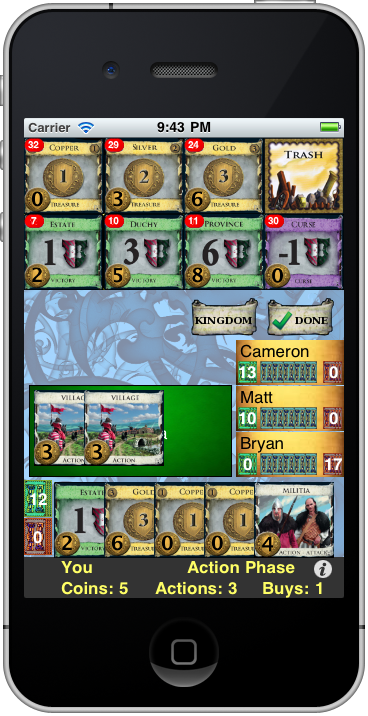 The character card gives the players a unique skill or ability that is theirs to use throughout the game. The role card is kept secret (except for the Sheriff) and determines each player’s course of action and goal for winning the game. The lawful (Sheriff and Deputies) win if they accomplish the task of killing all the Outlaws and the Renegade (the unlawful). The outlaws win by killing the sheriff, and the renegade wins by killing everyone. The trick to the Renegade, is that once the sheriff is killed, the game is over. So you have to kill off everyone else and essentially protect the sheriff until it’s mano e mano. Since the role cards are kept secret (except the sheriff), there’s lots of guessing, and blame-laying going on throughout the game. Honestly, the Renegade, while most challenging, is probably my favorite role to play; you are the complete and total wild card at the table and if you play it right, you’ll have the sheriff killing off deputies mid-game. Lot’s of fun! The game is designed for4-7 players so it’s a great game for a larger group, and the play time is about 30 minutes (which in my book qualifies as a “quick play”). 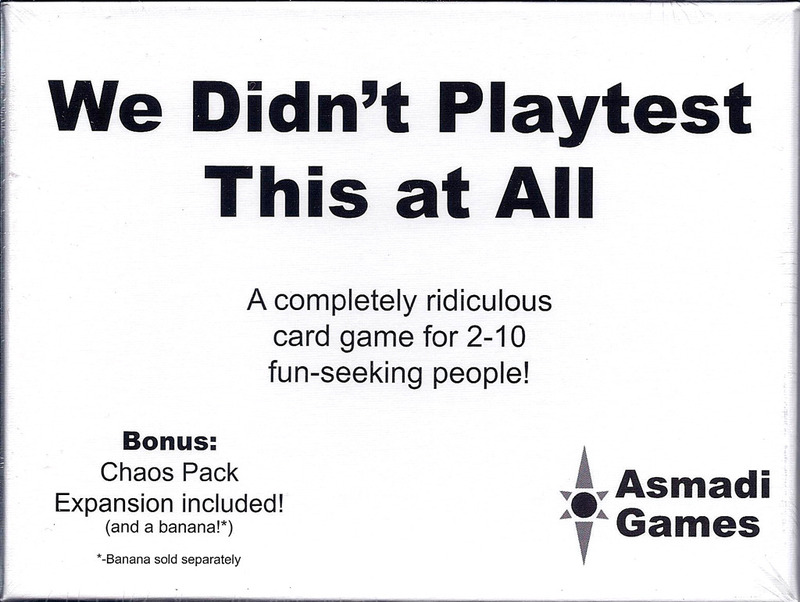 Even when playing with my most “pious” of friends, the temptation to play a “BANG!” card, and blurt out some reference to a euphemism in western culture concerning what said player “did” to the other player by playing the “BANG!” card, is virtually irresistible. If you’re going to play with teenagers, I suggest being in a mindset of complete self control. Don’t even crack that door open with them, cause it will be game over well before the game is, well, over. I mentioned cards that heal damage early; there are 2 types of cards that heal damage to characters, and one is the “Beer” card. Yep, have a nice cold one and you’ll heal one hit point to your character. The other is the saloon—belly up to the saloon and the whole table gets healed one hit point. Some people change this to root beer to avoid promoting drinking. Your call. The artwork on the cards is very cartoonish; there’s nothing gory or distasteful about letting fly with your favorite six-shooter. And in the style of the spaghetti western, they’ve even gone so far as to put the card text into Italian underneath the English. All in all, the game can be fun if the players really get into their roles and you’re fortunate enough to survive the first time around the table. As always thanks for reading, and if there are any games you’d like us to review, feel free to leave your requests in the comments! Heartland Hauling More Kickstarter News! A few weeks ago Scott interviewed “The Great Heartland Hauling Co.” designer Jason Kotarski, as he and game publisher Dice Hate Me Games kicked off their Kickstarter campaign to get the game into production. Since then they’ve hit their funding goal and they have also reached their first stretch goal! That means they’ve raised enough cash to include the Truck Stop INspansion. A feature of the game that will allow players to upgrade their rigs, give them special abilities, and hopefully an edge on other truckers while they’re trucking cross country. 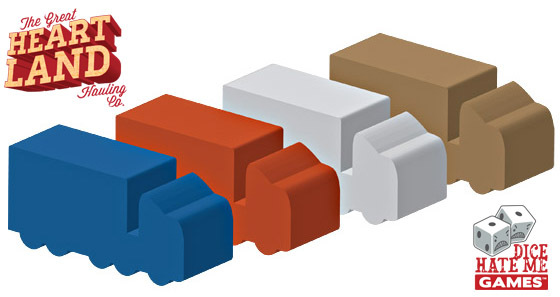 Last night we got a sneak peek at the next stretch goal for the project: truck meeples! Oh, and you can’t have the orange one…it’s mine. And check out our interview with Jason here. Well, it’s official. The “sequel” to The Resistance has a Arthurian theme—and it’s now live on Kickstarter. 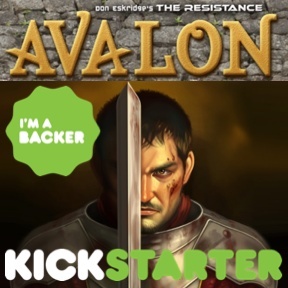 A mere $20 gets you The Resistance: Avalon delivered to your door—plus whatever promos and stretch goals they come up with before the campaign ends in 22 days. One of the promos is a set of anime cards you can use to replace the character cards in the original game. Unfortunately, some of the characters are the stereotypical anime women with ridiculous proportions—like Dolly Parton in zero gravity. Also, one of the characters in the new version is Merlin, so if you’re put off by any sort of “magic,” you’ll want to stick with the original game. A surprise announcement that coincided with this one was a 2nd edition of the original game, that features a larger box (so they can get the game into department stores), and upgraded components, such as a superfluous tableau for each player. The gameplay is completely unchanged, otherwise. We’re ridiculously excited for this game. What about you? Thoughts on the new direction? Thanks for reading! I just recently stumbled upon this plain white boxed card game—the name of which is more of an excuse for what’s about to take place than an actual name. It was $8 and I had some credit to burn at my local game shop so I took a shot in the dark. WDPTAA is probably the fastest playing filler game you’ll come across. Each player is dealt 2 cards and someone decides that they are going to go first. The game is practically over at this point. Players can lose one at a time or in large fell swoops; the cards are random, deceptive, and at times downright goofy. The game has whiffs of Fluxx without all the housekeeping and pretentiousness of having categorized cards for “New Rules” or “Goals” etc. Just read the cards and try to get as many other players to lose on your turn as you can. And if someone else wins you might be lucky enough to be holding the “Spite” card which causes you both to lose! Hey if you can’t win, no one can, right? The new 2012 version has a “chaos pack” included with the base set. We immediately set those cards aside because it seemed way overboard for what was already taking place. But they add more conditions to game play for the whole table. They also include a good amount of blank cards so you can feel free to add your own flavor of insanity to the mix as well. Honestly, this game didn’t come off as annoying as I thought it would; we all had some pretty big laughs while playing it and it will come out again to fill up the time in between the longer games. If you don’t take it too seriously, it won’t disappoint.